Bloom-A-Thon Pink Double Azalea is now available. A new plant introduction, the Bloom-A-Thon® Pink Double Re-blooming Azalea Rhododendron will bring new pink color to your landscape in spring only to produce more new blooms again in late summer until hard frost. This Proven Winners evergreen shrub rhododendron produces beautiful double pink flowers sure to delight every plant connoisseur. A new Proven Winners plants, the Bloom-A-Thon® Pink Double matures in the 4 to 5 foot height range with a spread of 4 to 5 feet wide. Space these re-blooming azaleas 5 to 6 feet apart. As with many evergreen flowering shrubs, group them in mass plantings for large splashes of landscape color or use in borders, containers, or individually as specimen plants. This flowering evergreen shrub is also at home in woodland gardens or as foundation plants. These evergreen azaleas prefer light shade, adequate moisture and well drained soil rich in organic matter. Eliminate summer sun scorch by planting in part sun to dappled shade. Prune after spring bloom for shape. Fertilize in spring with a slow release blend for evergreen shrubs such as Hollytone®. 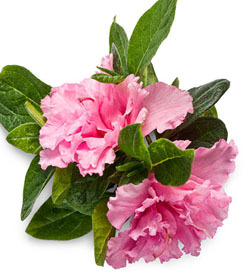 Bloom-A-Thon® Pink Double Azaleas are grown Quart pots.